Did you know Springfield is a Bicycle Friendly Community? We sure are. 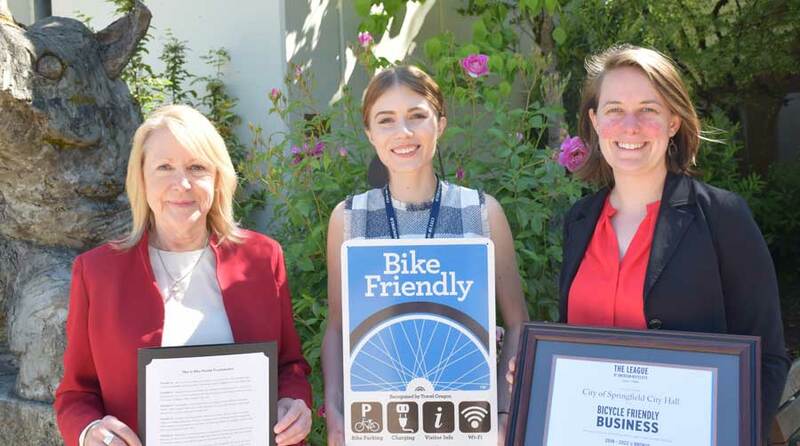 The League of American Bicyclists recognized the Springfield community for its improvements and support of bicycle transportation. 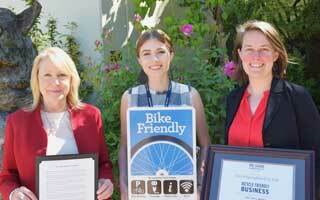 Springfield City Hall was also recognized by Travel Oregon as a Bike Friendly Business. Springfield’s road and path system, including the Mill Race Path and Thurston Hills mountain bike trails, attracts bicyclists each year, providing economic health, transportation, tourism, and scenic benefits. To improve safety and the user experience on several of Springfield regional community paths, we collaborated on new bicycle wayfinding and safety signs. The wayfinding signs provide directional, mileage, and approximate travel time information to destinations in and around Springfield. The safety signs are friendly reminders to bicyclists to yield to pedestrians and how to pass other path users. Creating a bicycle friendly community has a lot of advantages. It has been shown to improve residents’ health, well-being, and quality of life; and grow the economy of Springfield, improve traffic safety, and support student learning. It also helps reduce pollution, congestion, and wear and tear on our streets and roads. On top of all these benefits, biking is a great time and can lead to great places. For example, our Downtown has added more bike racks, most recently in front of Public House and Plank Town Brewing Company.